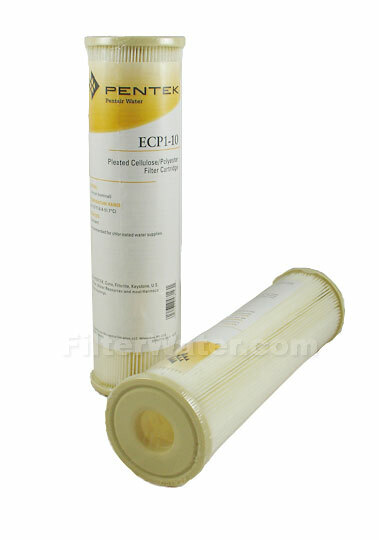 Pentek ECP1-10 10" X 2.5" Filter is a 1 micron 10" standard sediment water filter, product # 255431. Pentek Sediment Filter 255431-43 is designed with specially formulated resin-impregnated cellulose and polyester fibers for stronger filter and larger surface. Pentek ECP110 filter contains 6 square feet of filtration surface, when other typical non-pleated filters contain only 4.5 square feet. The Pentek ECP1-10 water filters provide higher wet strength than regular cellulose cartridges. ECP1-10 sediment filter also provides high flow rate and dirt-holding capacity, while maintaining a minimal pressure drop. Filter is pleated around a polyrpopylene core for added strength; the ends are immersed into thermo-setting vinyl plastisol. 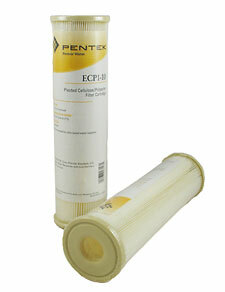 Pentek / Ametek ECP1-10 1 micron 10" Pleated Sediment Filter Cartridge. Recommended for chlorinated water supplies. Cellulose may start to break down if bacteria is present, such as in non-chlorinated wells. Do NOT use if the water is microbiologically unsafe or of unknown quality without adequate desinfection. Dimensions: actual 9-3/4" x 2-5/8" (248 mm x 67 mm), nominal 10"x2.5"
Will Fit PENTEK, Cuno, Filterite, Keystone, U.S. Water, Water Resources and most Harmsco filter housings. Also fit any other standard 10"x2.5" filter housing.